Once again it is the mayors of the world who are taking the lead for a culture of peace. 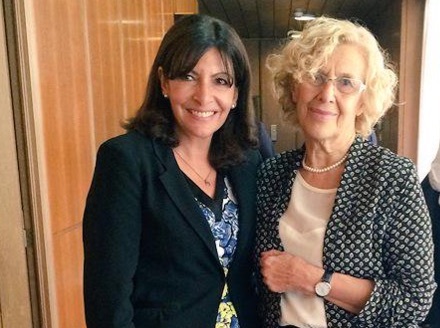 Manuela Carmena, the mayor of Madrid, elected last year at the head of a socialist coalition, and Anne Hidalgo, the socialist mayor of Paris, are planning to hold an international forum against violence and for peace education in Madrid in the near future. Their announcement was made at a forum of mayors in Paris prior to the COP21 climate conference. The forum will invite leaders from local governments and civil society as well as peace specialists. Mayor Carmena recalled that the terrorist attacks in Paris on November 13, in which 130 people were killed, were similar to those in Madrid on March 11, 2004. Hence, their cities have a special reason and responsibility to work for peace. “How is it possible that young people who grew up in our cities have resorted to violence?” We must help them find another way forward. We must draw lessons from the tragedies in our cities and find ways to resolve conflicts without violence. How can culture of peace be developed at the municipal level? I am interested on the activities to be developed in Madrid supporting the initiatives of Majors for Peace. Please, do not hesitate sending me related information about this issue. I have not been able to find information about the dates for the forum. As for invitations, I am not officially connected to the forum but simply publishing its news. Have a date and venue been set, or proposed? Is very important to me, to can participate in the summit for the culture of peace. I am a leader of Cátedra de la Paz, in my country Colombia.